Playing the not-paying-for-parking game isn’t very much fun when you lose. Paying the $5 price to park all day is a lot easier on the student budget than the $50 fine (or $25 if you pay within seven days) for dodging the day rate, but students are still finding it steep. Will George, the student rep on the parking appeals and advisory committee, is taking complaints about expensive parking head-on. A proposal suggesting some adjustments to campus parking has been drafted and will be be presented to the committee, which makes recommendations to the vice president of administration and finance for policy changes and to the facilities services division for operational changes. The proposal suggests half-day rates ($3 for four hours for central parking lots), a dedicated carpool lot and a discounted rate in lot N at $4 per day. It will be presented at the parking appeals and advisory committee’s next meeting, which is yet to be scheduled. George said he is confident that the committee will be in favor of the recommendations. “When talking to students about parking rates everyone wants something to change but it’s all about taking the right steps and developing a proposal that meets the financial needs of the institution as well as the students’ needs,” George said. In addition to the murmur around campus, George said the expense of parking was brought up in the student caucus as a “major issue.” The mock parking meter, a.k.a. complaint box, erected by fine arts students Levi Glass and Harrison Ross in October, garnered 95 unanimously negative complaints about parking from students and faculty. George consulted with Glass and Ross over the student complaints that were “filed” in the complaint box and said students generally feel the increase in parking over the past couple of years is just another burden on them. 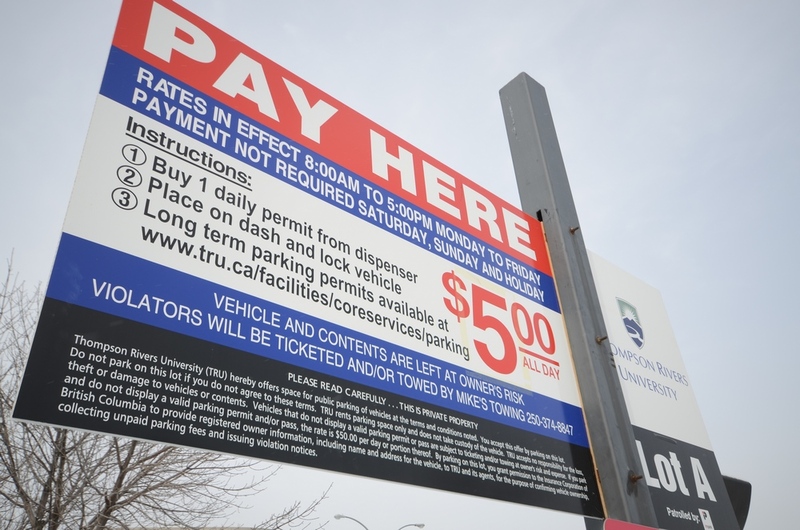 “We are trying to do a balanced proposal between TRU and students because the challenge with the parking issue is that for TRU, it’s really all about revenue,” George said. According to George, the three suggestions were prioritized from a list of ten. The half-day rate is an attempt to offer more affordable parking and more flexibility for students. Metered parking currently costs $1 per half hour with a maximum of two hours, a problem for students who might only have one three hour class. A dedicated carpool lot is being suggested because there is currently a waitlist for the 40 carpool spots, it encourages more sustainable transportation and it would be easier to enforce than having spaces throughout campus. George said lot N is currently underutilized and it’s on the outskirts of campus so it would be fair to offer a cheaper rate to park there. A more sustainable transportation solution is to take the bus, but George maintained that taking the bus isn’t a reliable option for everyone. In the meantime, some students have attempted to expand their options and park off campus, either in nearby residential areas or commercial lots – but it’s not going unnoticed. Most of the surrounding commercial lots have a two-hour parking policy and are monitored. The main supervisor for Columbia Place and Columbia Square, Tim Arnold, said “everyone in the neighborhood” is dealing with students trying to park in their lots and they have a zero tolerance policy. Students can expect a $40 ticket for their first offence in Columbia Place and the offence will be recorded, Arnold said. If they are caught again they’ll get a boot on their tire, which they will have to pay to have removed. Then, if they still insist on parking in the lot they will be towed. Arnold said they ticket students quite regularly. Superstore manager Glenn Gregory said they also deal with students parking in their lot. They try to warn students on their first offence but they will tow if the student persists, he said.